Boundary Systems of Cleveland hosted the event. Many thanks to them for supporting the group. Without sponsors like this, a user group would have to charge users for an event. Shane Brenner (shane.brenner@emerson.com) introduced the speakers of the conference. Before the speakers presented, lunch was served… and it was an impressive and elegant layout of soups and cold cuts that Embassy Suites prepared for the group. It’s hard to keep anyone’s attention span when there’s a “rumbly in the tumbly”. During and after each presentation, engaging discussions ensued. The first presentation shared tips and tricks and work-flow for curves and surfaces. Bart shared information on surfacing from an engineer’s perspective to help engineers understand form and how light reflects off form. The first part of his presentation explained the lattice box or the 3D bounding box techniques for surfacing. He showed how ISDX can be robust and even how parametric the free form tools can be. The second part of Bart’s presentation attempted to show how curves and surfaces aid non-surfacing users in their everyday jobs and tasks such as in mechanism design. The second presentation was by PTC’s platform. 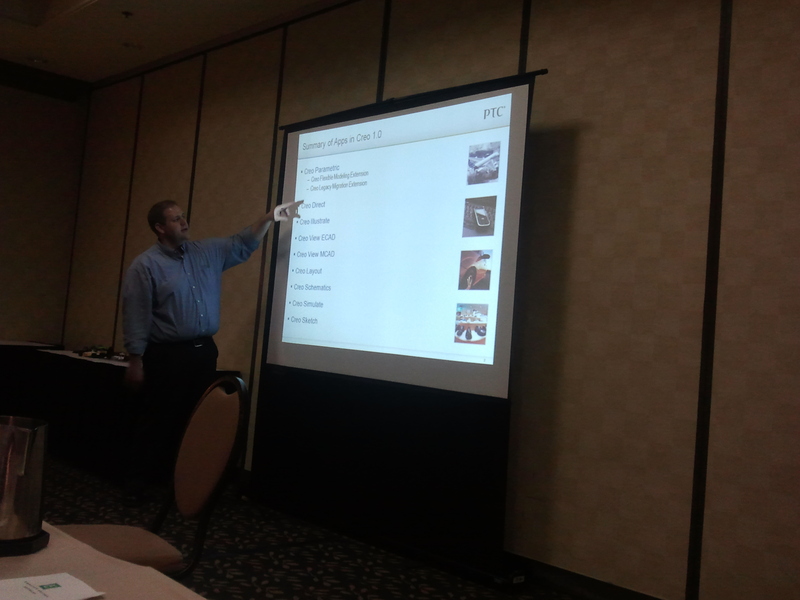 They introduced us to the the Creo line of products and the future of Creo. From this presentation, we better understood the name change. We also have insight into how the four pinnacle Elements that PTC offers (Parametric, Direct, PDF, and the Summation tools like MathCAD), may mature into. The last presentation was about Creo Elements Direct or what will be called Creo Direct. 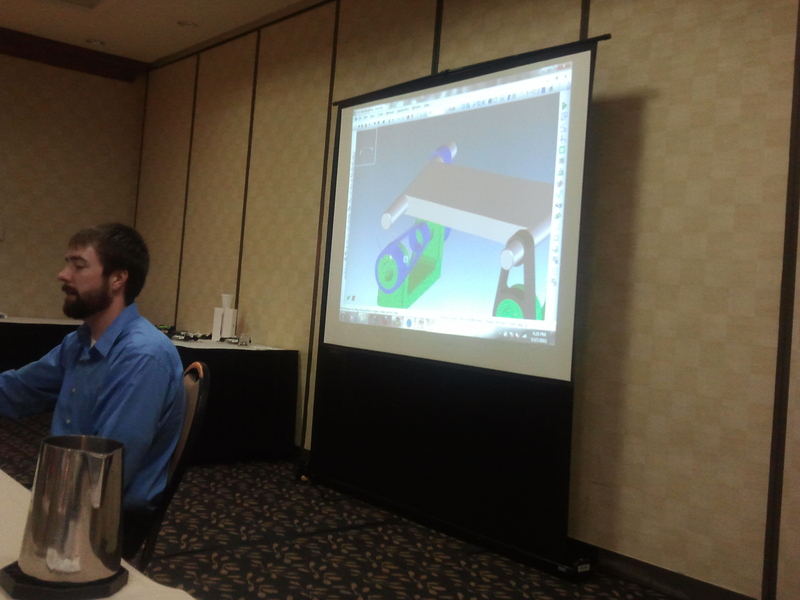 Wade first impressed us with the Creo Direct workflow. It was also interesting to see how the PTC direct modeler will mature as it is integrated into the PTC parametric modeling tools. The live demonstration was impressive as Wade created a bracket assembly using the Direct tools. Wade explained that Creo Elements Direct utilizes a very different work-flow from what seasoned Pro/E users are accustomed to.With a little practice, it is easy to get the hang of designing with the tool. After the presentations were done, a prize drawing took place to give away an Ipad & die-cast Indy cars.